DecorMyEyes.com is committed to making your favorite frames look their best, even after they have been through the worst trauma. Click the 'Fix My Frame' button below to submit your new order. You will only be required to pay for shipping at this time. We will use this payment to either send you the repaired frame or send back your un-repaired frame , if you choose to deny our quoted price. Send us your damaged eyewear. Wrap your frames with a cleaning cloth or tissue. Wrap your item in bubble wrap to protect it from damage. Ship the protected frame(s) in a small box or padded envelope. To ensure the fastest possible service, Please be sure to include your order number in your shipment. Your order number will be issued to you on the screen and emailed to you upon completion of the order process. As per request of the Repair Facility please do not send bulky cases if at all possible. They do not fit on the repair trays. A small flat case is ok, but they prefer bubble wrap. Rest Assured, There simply isn't much that we can't repair!" The skilled technology that we use at our facility gives us the opportunity to do many repairs that normally could not be done. One of our Trained Technicians will examine your frame and email you or call you with a repair quote. If you choose to deny, thats fine too. We will gladly send you back your frames using the shipping money you already paid. That's it. In less than 10 days, we will deliver your repaired new glasses directly to your door step. We offer all kinds of lense replacements. If the frame is a new style, we can easily order a new set of lenses from the manufacturer. For older style we have a lab onsite that will quickly and easily re-create the same lense for your frame for a natural perfect fit. Whether this frame is an optical frame or a pair of sunglasses we will do the job right. Metal frames can be permanently repaired with the soldering or welding process. We use 10K gold and silver solder specially formulated for eyeglass repair. This solder creates a bond that is much stronger than what you get from the manufacturer. Once the repair has been made, we buff and polish the area. Then, it gets a good cleaning in the ultrasound tank, which cleans the lens and frame, and then refinished with either paint or platting. The final touch is to align the frame and mail it back to you. Our goal is to give you a product that you will be proud of. 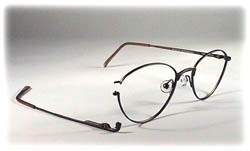 Plastic frames are repaired or replacement parts are used. Our repair process is unique and makes a permanent fix.If repaired, the repaired area is buffed and polished. The frame is then cleaned with ultrasound and, if need be, touched up with paint. It is then aligned and mailed back to the customer. We have a large inventory of parts for plastic eyeglasses and sunglasses.Our goal is to give you a product that you will be proud of. 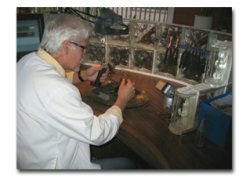 We offer all kinds of crystal replacements. If the frame is a new style, we can easily order a new set of crystals from the manufacturer. For older style we have a lab onsite that will quickly and easily re-create the same crystals for your frame for a natural perfect fit. Whether this frame is an optical frame or a pair of sunglasses we will do the job right. We offer a unique gold plating service to restore your rubbed out frames to a natural looking gold shine. Any metal frame can be gold plated. If you have the desire for a clean gold look, you may send us the frame to plate. Let us start by saying, every repair is different. They may have similarities but all have small differences that make each one unique. That’s why it is impossible to give someone an exact price quote without seeing the broken frame. Most frame repairs will cost anywhere between $25 and $65. Much cheaper than a new frame.